The nursery is FINALLY done. I just finished steaming the carpets, and everything is in it's place, ready for the little man's arrival. Well, there is one minor detail missing (besides the babe of course!). My good friend Rachel is making a canvas to go over his changing table. Since I dragged my feet in getting her the info she needed to make the canvas, it's still not finished yet. But I figured I better get this little tour done before I actually have him... because at that point we all know that I won't have the time or energy to "show" you around his room. It's pretty much the same as Brayden's nursery (well, the same room actually), but here goes nothing! -The crib is borrowed from a friend, since B is still using his. The bedding is Wendy Bellismo and is the same as what I used for Brayden (the crib skirt is with my friend Rachel so she could get the colors for the canvas). I bought the bedding at TJ Maxx for $15 for the entire set. My favorite part about the bedding is that the bumpers are slip covered, meaning I can take them off and only wash the fabric, not all the cotton. Totally recommend that! The letters are from a lady on ebay. She makes them by hand, and will paint them any color you want. I had the same exact letters with Brayden's name over his crib. -The little sign that was on my diaper cake from my shower with my church friends. I love it. Right now I have it hanging on the changing table since Brayden likes to pull on it on the door handle and I am afraid it will rip. -some of the (many) shoes that this little guy has. I keep them in the changing table. I just had to show yall because I seriously LOVE baby shoes. -the sign that's over the door. This was also used in Brayden's nursery and I decided to keep it there because I really find peace in remembering that Jesus is watching over my little one. My Aunt and Uncle gave this to me when we found out we were pregnant with Brayden. -the little cross is from Walmart, and I used it in Brayden's nursery. The only reason that i don't have it in Brayden's room is because Brayden likes to pull on it and I am afraid he'll break it. It was the first thing I bought after I found out I was having a boy (when I was preggo with B). 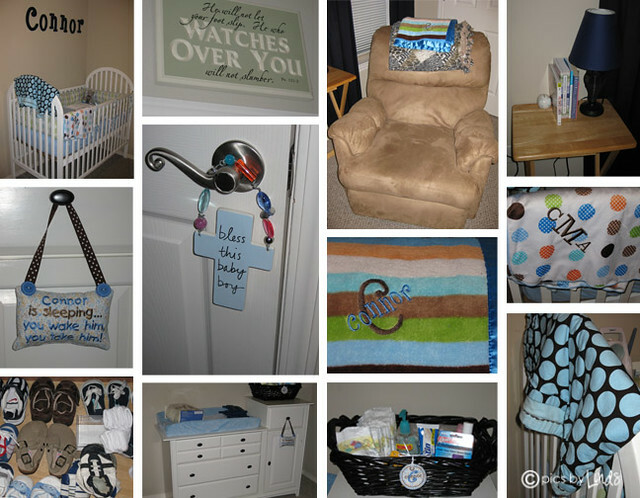 -the changing table. Probably the piece I am most proud of. I bought this changing table on craigslist for $25. It was honey oak (I should have made a before picture) with porcelain handles that had roses painted on them. Drew painted the table white with some leftover paint from Brayden's dresser, and we purchased a set of knobs at Target for $15. Drew also had to fix one of the drawers, which was missing some ball bearings. In all, I think we spent about $50 for the table, and it's good as new. The changing pad (and cover) were purchased off of craigslist also, for $10 (I actually got two covers with it, but one of them is not shown). -my recliner, which is one of the most comfortable chairs you'll ever sit in. It's not a recliner that's made for a nursery, but I wanted it that way. The ones made for a nursery generally don't have a high back, and a lot of them don't have a foot rest, which is IMPERATIVE when you are waking up in the middle of the night to feed. This one reclines all the way back, which is especially nice when your baby will only sleep on you if they are sick (can you tell that's happened before?!). And just for the record, the animal print blanket is mine... I keep a blanket in the nursery for me to cover up with during MOTN feedings, in addition to a blanket for the baby. -speaking of blankets, I got this blanket at my shower with my church friends... I LOVE it! It's from Walmart if anyone is wondering. I had it embroidered with his name and big initial and love the way it turned out! -the basket of diapers and lotion. The basket is from Walmart. I couldn't find anything I liked as far as an organizer goes, so just decided to stick to wicker. I used one of the little tags that was on my diaper cake from my shower to add a personal little touch to it. -the nightstand, AKA tv tray. I looked for something used to use as a night stand and could not find anything I liked, or if I liked it, it was more than I wanted to spend. So we'll just use a tv tray. The books on the table are: A Pig Takes a Bath (Connor's first and only book that was given to him by some dear friends), Babywise (couldn't live without it! ), What to Expect the First Year, and a few breastfeeding books that I found helpful when I was starting out with Brayden. -one of the blankets hanging on Connor's crib. It was also given to me at a shower, and also from Walmart. I had his monogram put on it. -Another blanket, that my MOPS table leader made for me and gave to me at my MOPS shower. I love it because it's a HUGE square... perfect for either swaddling OR playing on the floor! She also made a matching burp cloth that is super cute! And that's his nursery. Of course there's a closet full of clothes, but it's still kind of messy so I decided to forgo showing you all of that (you'll see the cute outfits soon enough on little man!). It's all ready and waiting... now it's just a guessing game as to when he'll decide to come!